The mighty Marvel marketing machine is in full swing for the impending arrival of Avengers: Infinity War. With two trailers, countless magazine covers, and entertainment outlets scouring the material for small details you might have missed, it may seem like there are few questions left to ask about this summer's biggest big-screen event. But there is one, and it looms large in the minds of every fan. Well, some of them, anyway. Where's Hawkeye? If Infinity War is "the culmination of the entire Marvel Cinematic Universe," how could one of the six founding cinematic Avengers not be a central figure? 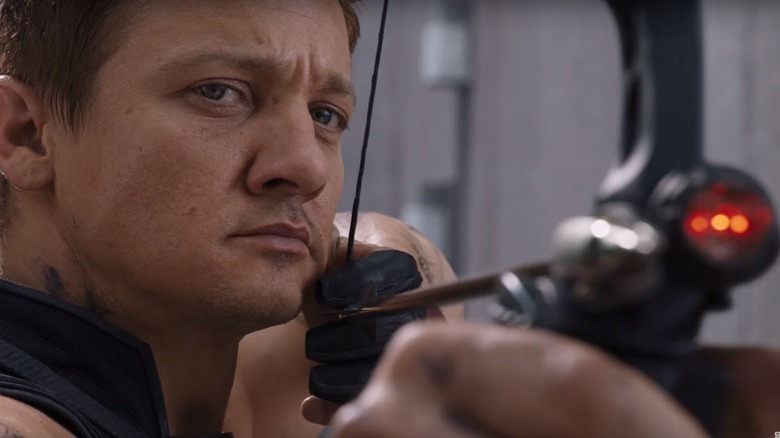 Jeremy Renner's Clint Barton has been conspicuously absent from the hype so far, although directors Joe and Anthony Russo promise that he has a "special spot" in the movie. In our ongoing effort to guide you through the build-up to "the most ambitious crossover event in history," we've scoured not only the film's production, but the history of Hawkeye in movies and comics in search of possible explanations for the secrecy. 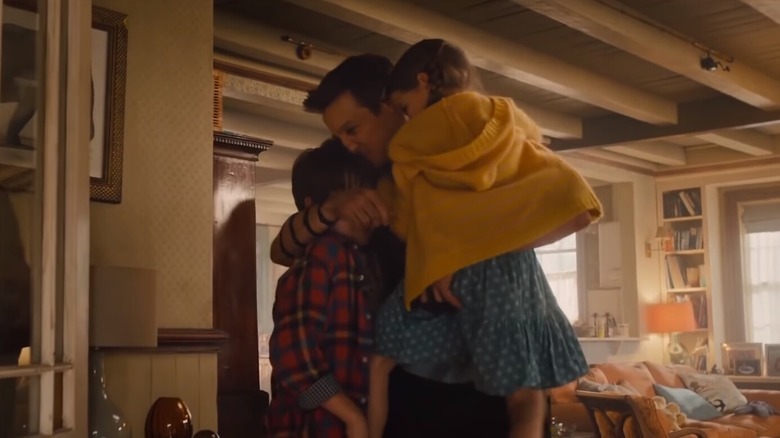 In Avengers: Age of Ultron, Joss Whedon introduced Hawkeye's home life, revealing that he has a family and a farm that had never been mentioned before. His wife, Laura, is pregnant with their third child, and Clint is eager to spend more time at home when the avenging business is wrapped up. In Captain America: Civil War, he enters the fray only at the last minute, having declared himself "retired" when the conflict between Cap and Iron Man began to heat up. When we last saw Hawkeye, he was being busted out of the maximum security Raft prison by Captain America. It seems like a safe bet that he went straight back to his family as soon as possible, and maybe he'll have to be talked out of retirement once more to save the universe from Thanos. After all, without Steve Rogers hanging around the Barton farm, those logs aren't going to tear themselves in half. On the other hand, there might not be a farm to go back to. In the Ultimates comics by Mark Millar and Bryan Hitch that introduced Laura Barton, she and her children are eventually murdered by a black ops team. A grief-stricken Clint becomes violent and reckless, donning an edgy new costume. Another comics arc in New Avengers by Brian Michael Bendis and Leinil Yu had Clint don a new superhero codename, Ronin, in the aftermath of the Civil War event. The identity was handed off to him by Maya Lopez, a Daredevil supporting character also known as Echo. Barton would remain Ronin for only a brief period before rejoining the Avengers as Hawkeye. 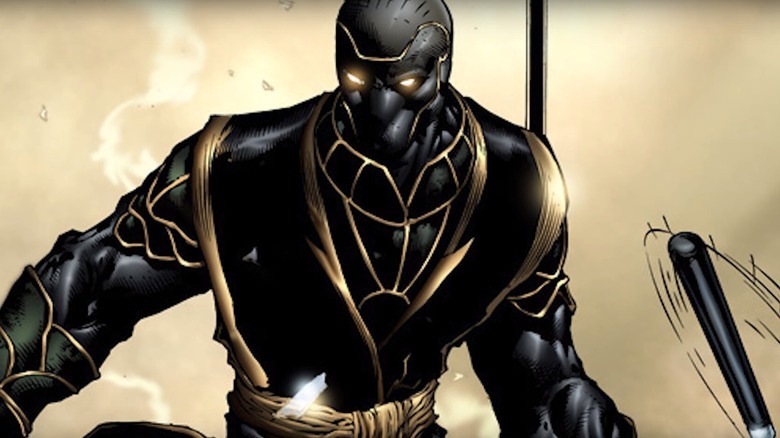 The Marvel Cinematic Universe has a history of combining elements from various takes on its characters, and set reports hint at nods to both Hawkeye's Ultimates look and his stint as Ronin. Given that he's now a fugitive, Thanos stands to potentially wipe out half the universe, and the as-yet untitled Avengers 4 has been shooting in Japan, it all adds up. Hawkeye has always had a lot of tricks in his quiver. In the comics and onscreen, he's wielded arrows that double as explosives, adhesives, boomerangs, and grappling hooks. He can even hack computers with them. It should come as no surprise, then, that the cosmic conflict at the center of Infinity War will provide him with an exciting new arsenal. Russell Bobbitt, the film's property master, is the man responsible for most of the onscreen incarnations of the Avengers' iconic accessories, from the arc reactor to Mjolnir. 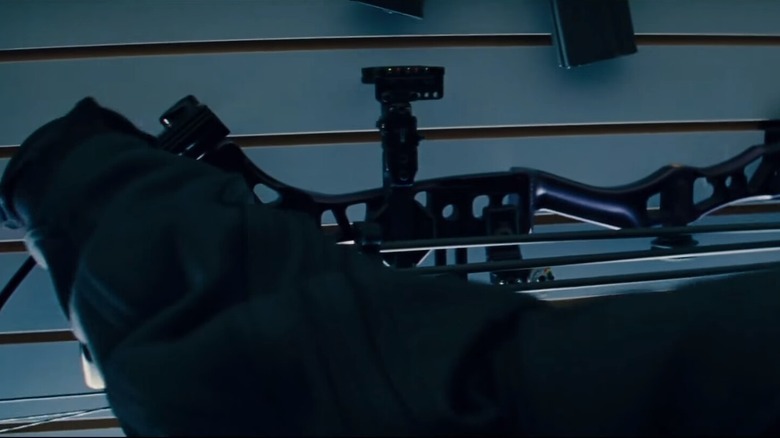 Bobbitt promised during a set visit by ScreenRant that "Hawkeye's getting a lot of cool new stuff" and went on to elaborate, "We're developing a lot of interesting new stuff for him…both in something bow-related but some new gadgets that he has in addition to the bow." This tease not only guarantees that Hawkeye's skills will prove integral to the battle, but possibly explains his absence from large parts of the story. He doesn't have S.H.I.E.L.D. just handing him tech anymore, after all. If he's late in arriving to the party, it might just be because he's been scouring the trick arrow black market. The ticking clock in Infinity War is going to be Thanos' hunt for the final Infinity Stones. 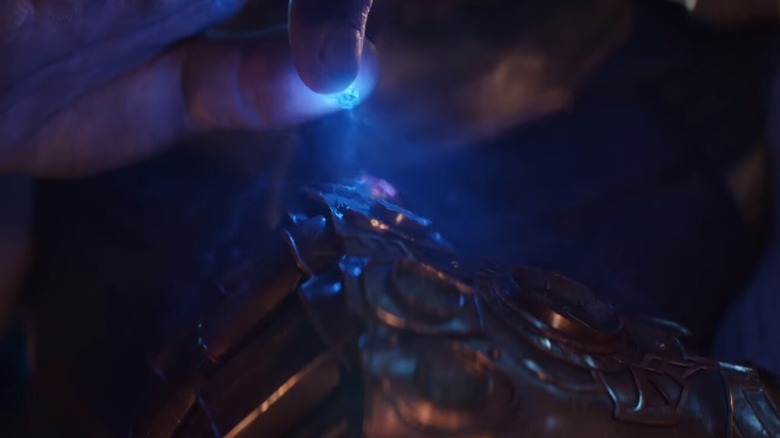 In the trailers, we can see that he's already got the purple Space Stone, last seen in Guardians of the Galaxy, and we watch him acquire the blue Power Stone from inside the Tesseract. We know that the yellow Mind Stone is embedded in Vision's head, Doctor Strange has the green Time Stone in the Eye of Agamotto, the red Reality Stone joined the Collector's collection at the end of Thor: The Dark World. That just leaves the orange Soul Stone's whereabouts unknown. The Infinity War prelude comics have set up this gem's importance as potentially "the biggest threat of them all." There's no shortage of theories swirling among Marvel fans as to where it might be, the most popular being that it's in Wakanda. But let's not rule out the possibility that the ad campaign's two biggest secrets could be related, and Hawkeye is somehow in hiding with the crucial jewel. 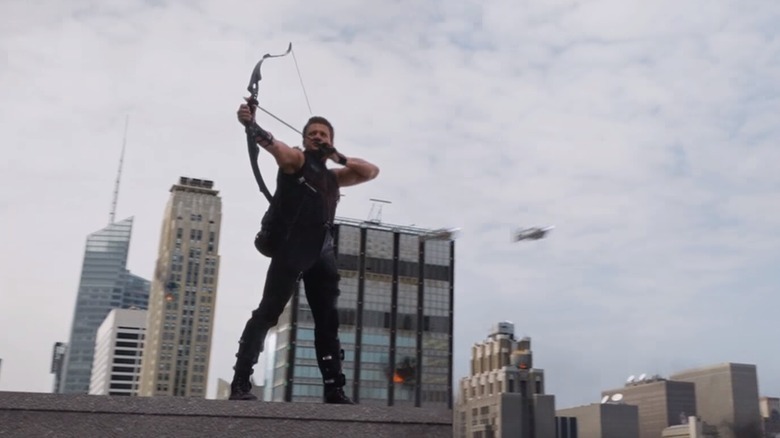 Maybe Hawkeye really is in all these scenes we're glimpsing, but there's no room for him in any of the action shots. With the exception of Whedon's first Avengers, all the other Marvel Cinematic Universe movies have been shot in the 2.35:1 "Scope" aspect ratio, allowing a wide canvas for framing the action. Infinity War, however, marks a departure from this tradition, being the first Hollywood film to be shot entirely with IMAX cameras. The IMAX format has been used in narrative features before, most notably by Christopher Nolan, but only to highlight particularly spectacular action sequences. 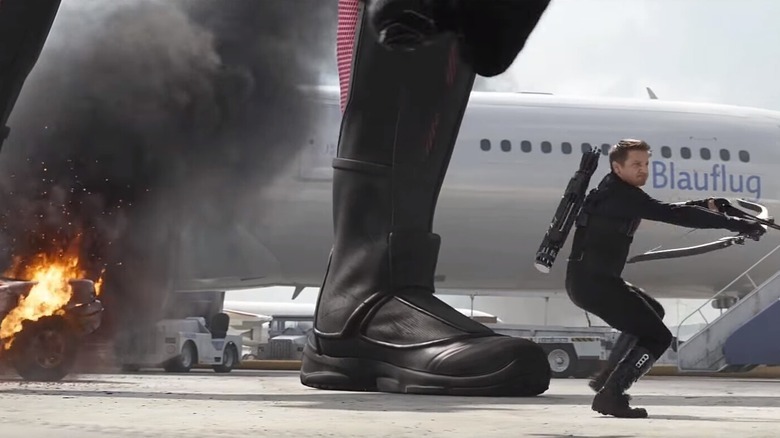 The new IMAX/Arri digital rig allows greater freedom of movement than previous cameras, and the Russo Brothers are taking advantage of it to truly show off their clash of "unnaturally tall" characters. But the frame could also prohibit having as many characters stand beside each other as in previous entries, so perhaps Hawkeye is there after all, just slightly to the left. 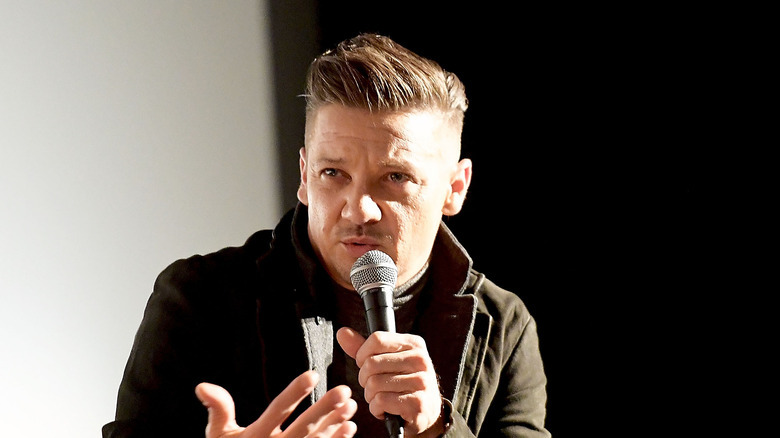 "A haircut is a haircut," Jeremy Renner told the South China Morning Post in regards to his Infinity War look. "Sometimes I get a choice in the matter, and sometimes…" Trailing off with a shrug, he gestured to the sharp mohawk-adjacent coiffure he was sporting on location. Renner's own Instagram provided a close-up peek at the cut, even if the official marketing is still keeping his look under wraps. Most of the Avengers represent peak human conditioning, whether it's because they're super-powered, super-rich, or are literally gods. 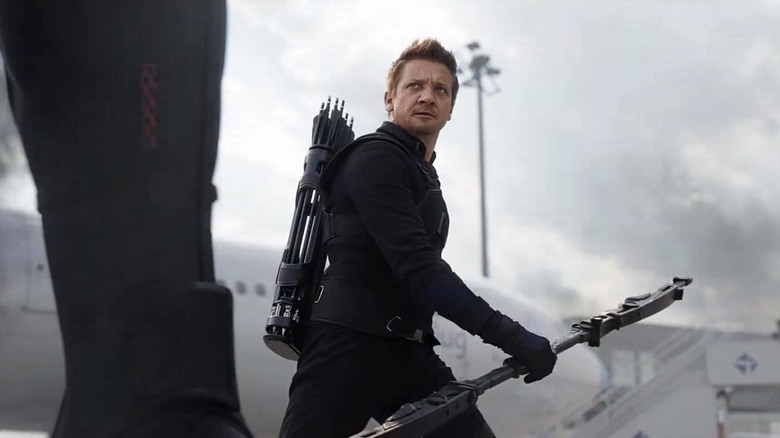 Clint Barton has always been the most down-to-earth member of the team, with Renner channeling an everyman vibe and dressing in tactical gear more practical than his the outfits of his outlandish allies. The coolest thing about him is his shades (except in circles where archery implements are considered killer fashion accessories). With fans already speculating about Black Widow's new blonde 'do, maybe Marvel feared that Hawkeye's hair would be too much to reveal just yet. An even bigger change in Hawkeye's look has been hinted at by photos taken on location in Georgia for Avengers 4. These shots show Jeremy Renner sporting a new full-sleeve arm tattoo, featuring intricate details that appear to include prominent skull designs. This is certainly a surprising turn for the usually low-key Clint Barton, suggesting that some pretty life-changing events may have spun him into a punk phase. This would certainly lend credence to the aforementioned speculations about tragedy befalling the Barton family and Clint assuming the Ronin mantle. But it also provides another possible explanation for Hawkeye's absence from the trailers. 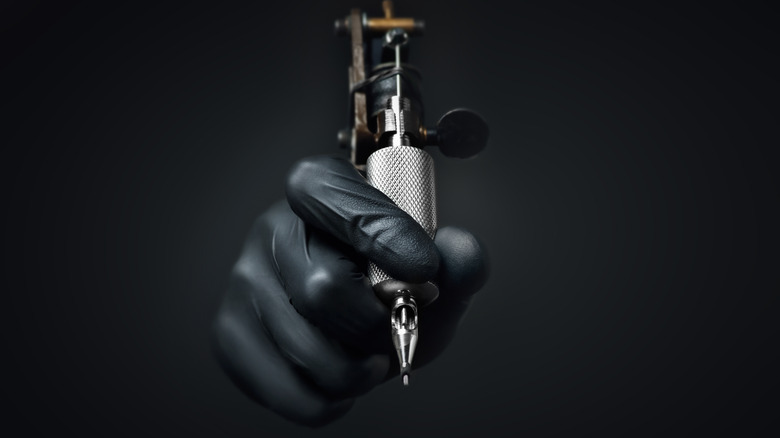 Maybe he just isn't in much of the film because he's occupied with the multiple sessions under the needle required for that kind of ink, and the healing process that would surely follow. Hard to sling arrows at a Mad Titan when you're maintaining a strict lotion regimen. Paul Rudd hasn't been particularly prominent in the Infinity War marketing either, even though he's confirmed to be in the film as Scott Lang, alias Ant-Man. Of course, you can never be totally positive that the mighty microscopic man isn't in any given shot. Maybe he's on Bucky's shoulder or something, who knows? Downplaying Lang regardless of his role in the movie does make sense, as Ant-Man and the Wasp is following incredibly close on the heels of Infinity War on July 6. Marvel is smart to avoid oversaturation or confusion with Rudd's starring role in a movie that will hit while Infinity War is still in theaters. Still, maybe the secretive absences of both Hawkeye and Ant-Man are connected. In the Avengers comics of the late 1960s, Clint Barton briefly took on the role of Goliath, though he was neither the first nor the last. Under this pseudonym, a giant-sized Barton towered over foes with the help of the same Pym Particles that make Ant-Man's size-changing abilities work. While it isn't all that likely, we can't rule out the possibility that these two Avengers are collaborating in secret, allowing a surprise climactic appearance of a giant Jeremy Renner stomping on Thanos. The Infinity Gauntlet may give Thanos unimaginable power over the universe, but the Reality Stone can't defy Occam's Razor. Yes, sometimes the simplest explanation is the correct one. It's possible that, in a movie event loaded with characters who lead their own franchises, Marvel knows that audiences just don't care enough about Hawkeye to feature him. Look how crowded Infinity War's poster already is. With all those muscles and mystic flourishes vying for real estate, there's just no room for a boy and his bow. Sure, Hawkeye has always had his fans, but even after he made his screen debut in Thor, he trailed his teammates in popularity with fans of both movies and comics. His biggest success has been in Matt Fraction and David Aja's award-winning comic series, which began in 2012 and featured the kind of street-level, non-superpowered stories not likely to feature in the films any time soon. 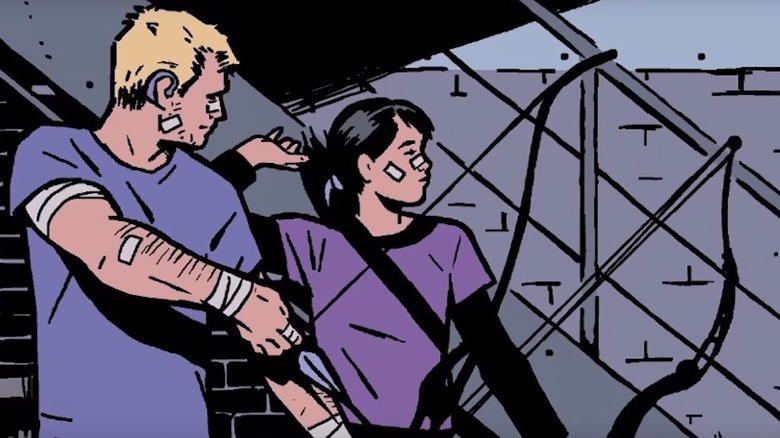 A big part of what made the Fraction and Aja comics so popular was that they made Clint Barton very relatable to many readers. Instead of focusing on world-saving Avengers exploits or his background in the circus (though those both did come up), these comics found Clint protecting his neighbors from petty criminals. When he wasn't doing that, he was struggling to get his life together, navigating awkward conversations with his exes, and wrestling with the complicated wiring of his home theater. The team got special acclaim for their use of sign language in an issue dealing with Hawkeye's hearing loss. What many fans seized on most of all, though, was Clint's coffee addiction. In an early issue, he lamented a spill by muttering, "Aww, coffee, no," and it became something of a catch phrase. This element has even crept into the movie version of the character, with Barton quipping in Civil War that he managed to rouse the disoriented Scott Lang with a cup of coffee. Maybe he isn't more involved in Infinity War because he's low on caffeine and needs to make a Starbucks run. Can't save the universe without that good, good bean, you know.